This was an absolutely stunning Yes gig! Having traveled from New Zealand with friend, Paul (and joined by many other �Kiwi� Yesfans), the Sydney Yesshow was everything we could have wished for - it even exceeded our high (vibration) expectations. 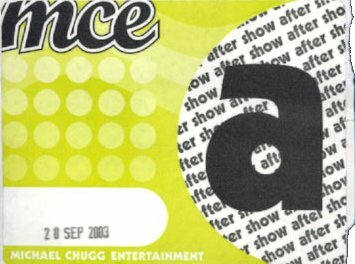 Advertising for the Australian shows seemed virtually non-existent, with no posters around the cities, or even the venues. There were a couple of articles in local music papers and I did see the TV ad once, featuring two songs that would not be performed! (�Owner�� and �Wonderous Stories�). The faithful had mainly heard about these historic events by word of mouth or via the net. THE SHOW: Right from the word �go� the band were locked in together, playing with pure intensity and confidence, feeding off the excitement and appreciation that the super-enthusiastic audience was exuding. 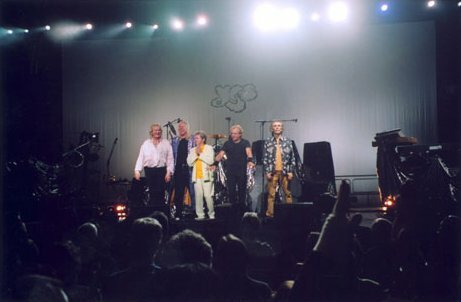 From the jaw-dropping performance of �Siberian Khatru� through to the levitatingly blissful �Awaken� and sing-a-long, raging, rocking �ISAGP� and �Roundabout�, it was clear that this was a VERY special Yes concert. 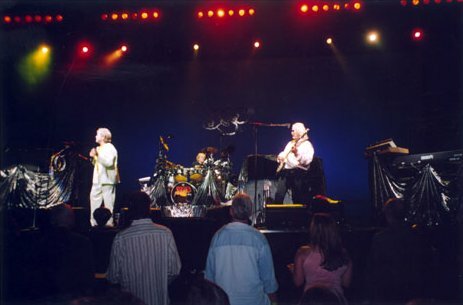 I had witnessed 3 Yesshows prior to Sydney �03 and this was the best! (Whilst L.A. �91 was an unbeatable, epic production, this felt like Yes concentrated to the finest elements, plus having many friends along for the ride made a truly positive difference. It was notable how the show differed so much from the previous night in Melbourne � from the least to the most fantastic in the space of 24 hours). �Magnification�/�DKTW� rocked big time - a heavy metal dude I spotted, wearing a W.A.S.P. shirt was obviously totally Yes converted, and surely would have changed into a Yes T-shirt - if there were any left at the merchandise counter! �ITPO� was exceptionally moving and the extended �SSOTS� was a wonder to behold, with Rick and Steve�s impressive �dueling� crescendo leaving everyone in the Entertainment Centre awestruck (even the robotic security guards). 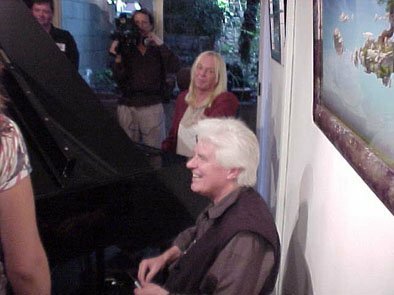 One particularly poignant moment was when Jon dedicated �Show Me� to his wife, Jane who was directly in front of me, four rows ahead. The song itself is spine-tingling enough, but right then the purple lights were magnified and prisms sparkled through her diamond earrings, creating an unforgettable image in my mind. Later, Janeee would join Jon on stage, to dance along to the much-demanded, usual encores (our calls for �Starship Trooper� going unheeded). Those present on September 20th 2003 will no doubt have fond memories of this concert � a show of mythic proportions. What a difference a day makes. After the mixed bag of Melbourne, Sydney turned out to be an absolute ripper. Prior to the show start I'd had to taxi across town to liberate two mates from the arms of "The Toxteth" so a little drama to start the night. That turned out ok though and we made our seats to catch the Sebastian Hardie set. An excellent one it was too. Well done Mario and the lads. As they finished and folks headed to the restrooms and bar a buzz started circulating that the break would only be ten minutes. Needless to say, I bypassed the bar queues and returned promptly to my seat five rows from the front, centre stage. >From that vantage point the sound and sight was superb. We'd truly landed in a sweet spot. As the firebird reached its conclusion Yes came onstage to a raptuous reception, proceeding to promptly tear the place down with a blistering performance of Siberian Khatru. Howe was literally incendiary. If his fingers wern't bleeding after that solo then they must be made of an asbestos and steel hybrid! And so the set proceeded as Yes delivered every song in the set with a fire and velocity that I have never witnessed before (not that my Yes concert experience is vast, mind you. I've only seen five shows in total). Two and a half hours passed in an avalanche of emotions and experiences served up by five of the best in the business. The camaraderie they exhibited on stage extended itself warmly around the 6500 in attendance and we were there with them. A great feeling. Any niggling doubts after last night in Melbourne evaporated as the band tore through the set with an almost obscene confidence. Every song was a highlight: The reverence and intense, respectful quiet afforded to Howe whilst he performed To be over was tension extended to the extreme. Many folks chose to clap along to 'Clap', as you'd expect; Xena2 was in the audience, as was Steve Howes brother, Phillip (hey, didn't he film Yessongs?) and the chap at the soundboard confirmed that the show had been recorded. So....c'mon Yes Inc. Please release this show via Yesworld! Another highlight that has to be mentioned was the absolutely stunning version of SSotS. Rick and Steves battle at the end was easily twice as long as any boot version I've heard from the 2002/Full Circle tour. Steve was leaping around like a jack rabbit firing salvos at Rick and vice versa. Both ended the dual with huge grins on their faces. Rather than go back through the set and do a song by song analysis I'll just repeat what I said earlier. Every song was a highlight. Backstage after the show was a whole different vibe to the the night before with happy smiling band members more than willing to chat and pose for shots. There's nothing like knowing you've done a good job. There's also *nothing* like a Yesshow. Thank you YES for the fantastic concert ! I believe this was the best concert I have been to. So much energy ! Thank you Sydney Entertainment Center for re-locating us to the center of the second row behind the mixers. 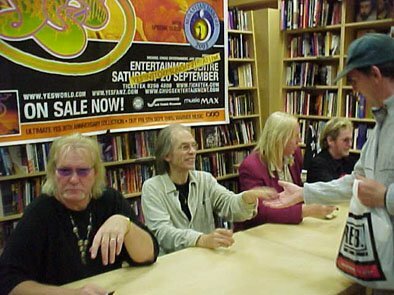 YES spent the day after the show in Sydney and indulged their fans with a 2 and a half hour "meet and greet" session at a CD shop in central Sydney. 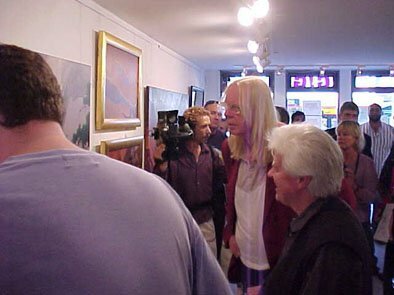 When I arrive at 3pm, Jon, Rick, Steve and Chris were all sitting at a long table and patiently shaking hands with fans and signing autographs. I handed a sport boomerang to Jon as a souvenir present and he asured me he would try it on his back lawn at home. The band even allowed photography and video filming without any protest. It was a warm but hazy spring day in Sydney (due to backburning) and I hope the band saw a little more of this beautiful city then the inside of a CD shop and an endless parade of adoring fans. 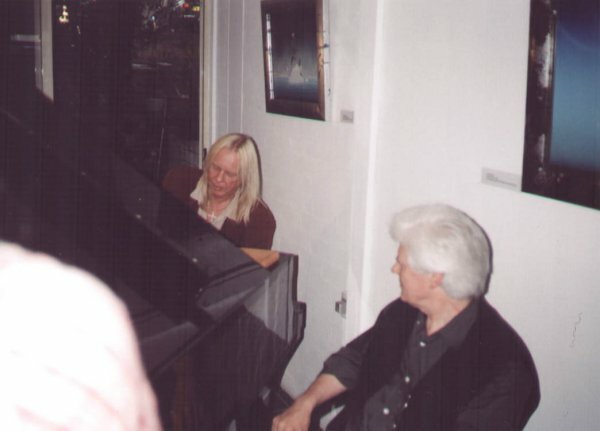 (Jon said during the concert that he had gone for a walk at the harbour with his wife Jane). "Australia - they'll take good care of ya"
Hang on, I'll start again. I've seen the last 5 Yes shows in Japan and Australia, and tonight's performance was by far the best one I saw. The band were cooking from the word go, and with Melbourne's technical problems well and truly fixed, Steve Howe was free to concentrate on his playing, and he gave his all, adding bits to riffs, leaping around, and generally looking like he was having a good time. The rest of the band were up there with him, and the music had a power and assurance that belied the age and familiarity of the pieces. The audience replied in kind, and Jon commented after And You And I ( which was just magnificent!) that he appreciated the audience listening so much, as it left him almost breathless. Jon kindly thanked Robert Forbes (the Yenfanz coordinator whose efforts helped Yes finally get here - cheers Robert!!! 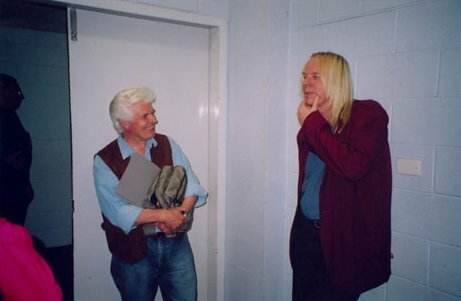 ), and before All Good People Jon also tried to encourage Roger Dean to come onstage and play tamborine, but to no avail. Sebastian Hardie once again did a great short set, but tonight they escaped having the power pulled on them by starting their set 10 minutes earlier than the proposed starting time. Having said that, it was still a great evening, and my friends and I left the venue ecstatic that we had seen the power of Yes at it's very very best. This will surely go down as one of the best gigs of the tour! The Yesfanz convention in the afternoon was also a lot of fun, As well as meeting fellow fans and traders, Sebastian Hardie did a panel interview, and Roger Dean, an extremely nice man, signed autographs and answered questions from everyone there. What a great guy! 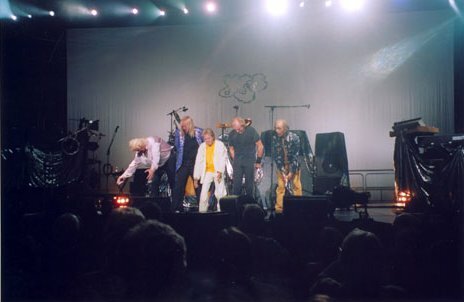 It was hoped that Yes would appear at the convention as they did in Melbourne, but unfortunately they couldn't make it so instead it was arranged that they would make an appearance after the gig in a function room at the hotel they were staying in. 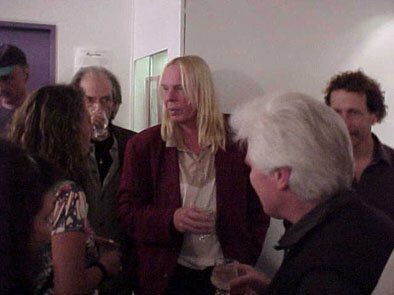 By the time we got there ( after 12.30) Steve Howe had been and gone, as he took off rather quickly when people started taking flash photos of him, which he hates. Jon and Rick weere there surrounded by fans, but a little persistance lead to an autograph and a quick "Hello, thanks for coming" for each of them. 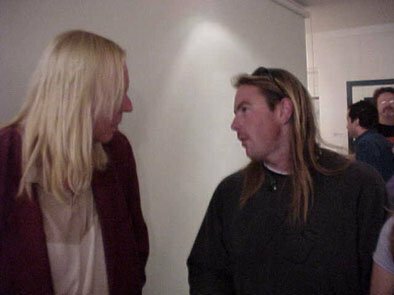 Alan White popped down afterwards and was was rather patient with the mobbing that he received. 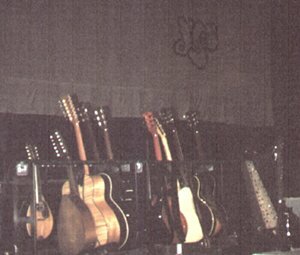 REPORT: SYDNEY ENTERTAINMENT CENTRE - SATURDAY 20 SEPTEMBER 2003. First, the bottom-line: a perfect Yes concert - in terms of performance, sound, songs, line-up, audience, support band and venue/city. Now for some details. Mention has to be given to the pre-gig "festival" held within the Centre by YESFANZ - the people who have worked for the last 18-24 months not only to help bring the band out, but to publicise awareness of Yes and tour and maximise the enjoyment of those fans that managed to hear about its activities. 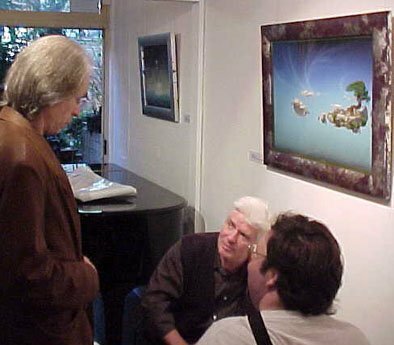 A crowd of 250-300 were treated (at a price, of course) to a display of privately-owned Roger Dean artwork and Yes memorabilia, food, drinks, a 'press conference' with Sebastian Hardie and "rock brain of the universe" Glenn A Baker, an appearance by Roger Dean, door-prizes (including a couple of my Yes solo-guitar CDs), shared memories and anticipation of the coming concert. Yes were promised (as much as possible) to turn-up and didn't - but made up for this afterwards. There were some obvious concerns due to the previous night's events. Sebastian Hardie openly put the incident behind them, but it was an unfortunate event that could have been prevented with more diplomacy. 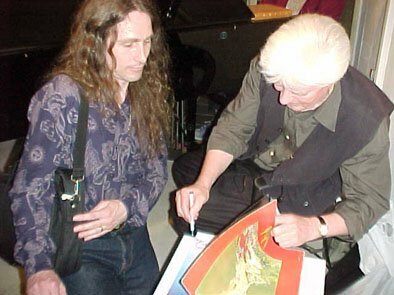 Roger Dean signed both my flyer for his local exhibition of works coinciding with the tour (see www.giggallery.com) and the outer cover of the remastered "Tales". Not having seen the latter before, he took some time to open it up and look it over, before stating "they've ruined it" (as it misses the inside album-spread), but I'm sure that was his uniquely-personal perspective on the matter. To accommodate any possible 'problems', Sebastian Hardie were rescheduled to start 15 minutes earlier. Had the expensive tour merchandise gone on sale early (many people openly baulked at the AU $70.00 top line T-shirts), this might have been OK - many people lost the chance to catch their opening as a result. Still, they made the most of the situation and played an impressive set to win over their 'home crowd'. I thought the pressure of working to time-restraints took its toll on the band's own enjoyment of the set, and guitarist/singer Mario Millo confirmed this when I spoke to him later. Before I move to Yes' performance, mention must be made of 'that' roadie/sound technician from the previous night. With due regard to his flawless work in setting-up and moving instruments (particularly Howe's guitars) on and off-stage, he was a too-obvious presence -seeming to possess both girth and ego in equally-large proportions during his work. He was also a decent guitar-player (I thought I heard the opening riff to the Mahavishnu Orchestra's "Birds Of Fire" during his guitar-tinkering), but he should have been much less visible throughout the whole proceedings. The concert seemed to be a complete sell-out. Yes came out to a standing ovation and played almost every song to the same response. That, and the rapt given attention during each song, was remarked upon by Jon - who said the 'combination' almost took his breath away. 1. Siberian Khatru: This seemed to start a little slow, but the pace picked up quickly enough. Steve - performing with real fire, precisiion and enjoyment for the whole concert - played an fine solo. 2. Magnification: Rick's revision and transformation of the orchstral parts put a real fire under this song. Those closer to him mentioned the amount of sheet music he had to read during it, but the results were certainly worth the effort. 3. Don't Kill The Whale: Not a major 'work' - but, following immediately afterwards, it helped resolve the the musical tension from the climax of Magnification. A concert for "true believers and true beginners"! Who would believe that 30 years later, in spite of all the crisis and storms, Yes would play in Sydney again to a cheering, listening and amazing crowd. After HOTSR Jon commented: "The energy of all of you, listening together, is so powerful!" He seemed genuinely touched. And who would believe that after 35 years, these guys can still reinvent themselves and their music. Would you believe that Steve Howe, in the intro solo of "Awaken", literally jumped up with his legs wide open in what may go down in history as one of his very rare "Townsendian" moments? You better believe it for he did it and thousands saw it. In the organ solo in the second part of "Awaken", the light were dimmed on stage and a gentle cascade of moving colours bathed Rick Wakeman and his keyboard ring, giving an actual impression that he was playing from another dimension, or rather taking all of us to another dimension, to a sphere of subtle beauty and spiritual power. You better believe for we all saw it in sheer and unadulterated amazement. Same set list as published in the previous reviews. William Blake, dear to Jon's heart, once wrote that "energy is eternal delight". I couldn't help feeling that in some moments of the concert it semeed we were all taking part in a ritual, the focus of which was the universal energy of music. There must be something about this band. My bet? The Mother-Goddess has smiled upon them. Jon voiced the gratitude of all of us when he thanked Robert Forbes, whose vision, daring and faith helped to bring Yes back to Sydney after 30 years. You have accumulated an enormous amount of meritorious karma, Bob. Thanks mate, from the bottom of the heart of a believer for thirty summers long. Profound pranams to Jon, Steve, Chris, Rick and Allan. Can the full circle be reduced to a year? We believe. This will be catered, compared, at the venue, with Roger Dean, Sebastian Hardie, and hopefully Yes attending. Tickets on sale through the website (above) till thursday 10am. It will be a good day. This is non-profit and organised by yes fans for yes fans. Wow, what can I say?? 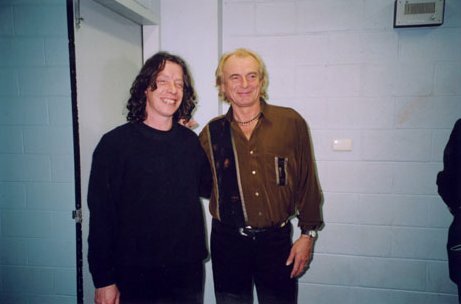 It'll be sort of a dream come true for me to be able to see Yes play in Sydney. I will of course explore Australia while I'm "down under". You see I'm travelling all the way from Stockholm, Sweden to see the band. I will also probably see them in Melbourne or Perth. I'm sure that they will put on a special show since Yes don't play "downunder" too often, I asume. Anyone who wants to meet up before/after the show? Regards Thomas. Yayyy! So the re-scheduled dates have finally been confirmed - thank (The Revealing Science Of) God!!! What a relief that our seats are still valid from the old dates. Now, if Jon can just keep off LADDERs, the band can keep MAGNIFYing everything around them, to finish off the FULL CIRCLE tour with an extra special couple of Yesshows in Australia. Hurrah! Thank you so much, thank you so much, great to be with you. Sorry we're a bit late, but, ahh, thank you for hanging out for us for the last few months and it's great to be with you. Here's a song that we recorded just a couple of years ago, very simple idea that magnification is to magnify everything that is good within you so that everything out there will magnify in equal terms, or something like that! (laughs) Or words to that effect. The song is called Magnification. Me and my honey, Jane, we walked around the Opera House today, and it was just too wonderful. It is just too amazing. And the fact that it was just finished thirty years ago ' and it's still there! Wow, just an observation. David, just take some highs out of my system there. I feel like I'm whistling through this discussion. Here's a song that, ahh, is about the energy that surrounds us. That's a little too much, David, sorry about this. The energy that surrounds us is just so powerful, with love ' love is everything. Thank you so much, thank you, thank you. Thank you for listening because that's a new song most of you haven't heard before, but the idea of it is that when we wake up every morning, we're in a sacred place, no matter what we think. We are in a sacred place ' it's just the way it is. Yeeeess! Wooh! But, thank you so much, love you too. Ahh, thirty years ago we did this album, thirty-one years ago, called 'Fragile' and, ahh, there was a band in the second studio called ELP, as you all know, Emerson, Lake and Palmer, and, ahh, they had a day off, which they enjoyed, that Sunday off, and I got the key and ran downstairs and did this song in the, ahh, in the studio. And, ahh, it's a little ditty and if you know the words, or any of the words, please sing along. Running away, running away with the key. That same evening, we wrote a song together, and ahh, the idea came in the lyric that, ahh, we climb mountains all the time, as part of the game, part of the knowing, part of the knowledge, part of the agreement, to climb mountains all the time. Thank you so much. Hope you enjoyed 'To Be Over'. Don't wanna stop. Are you having a good time' Having a good time' Hey, you guys. It's so amazing. I just want to thank this guy, Robert Forbes. He's really, ahh, we'll ask him to be our manager, actually. It's ahh, 'Show Me'. I'm going to do this thing first, it's like, ahh, (sung) doo doo doo doo doo dah dahh, it's great to be in Sydney, Australia, it's great to be in Sydney, Australia. So, I was saying earlier, me and my lovely wife, Jane were walking around Sydney harbour today and it's just a beautiful sight to behold and, ahh, I want to dedicate this song to Jane because, ahh, we travel together all the time and it's a wonderful thing. Love is very, very powerful and can conquer everything. Love is just so powerful and this is for you, Jane. The song is a song that I think I wrote many years ago but never recorded. So here we go. 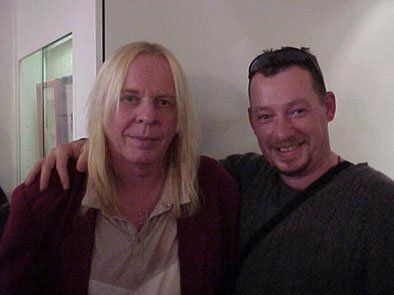 The original wizard of the keyboards, Mr. Rick Wakeman! He's been practicing, I can tell. On the count of four - Heart Of The Sunrise. 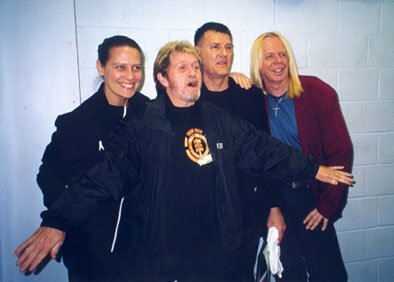 On bass guitar, Mr. Chris Squire! On the drums, Mr. Alan White on drums! Thank you so much, thank you so much. Really, it's been great to be able to play for you tonight and we want to thank you all for coming along tonight. And I've just got a couple of little things, ah. Tomorrow we're staying in Sydney so we're going to do ahh, you know Borders in Pitt Street, anybody know' Well, come down and meet and greet us, and ahh, Steve's going to do some guitar lessons, ahh, Rick's going to tell you jokes, ahh, Chris is going to serve you a drink, any requests' And Alan's going to give you lots of hugs and I'll just keep talking! And also, one quick thing. 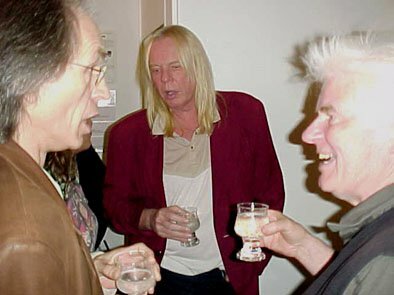 We were just trying to get, ahh, Roger Dean to come up and play tambourine but he's such a shy guy! He's got a gig tomorrow. He's got, I think it's down at, I've got it written down - at Gig Gallery in Glebe. Not far from here, Gig Gallery at Glebe, 73 where it is, just go along. He's showing all his amazing work - and he won't come on stage and play tambourine! I'm going to sing a song in the key of Laaaa. Please sing along and halfway through, get up and boogie!